Dallas County District Attorney Craig Watkins has gained a national reputation for spearheading prisoner exonerations. Watkins, a Democrat who was first elected in 2006, gained attention for using DNA tests to overturn convictions, and he said his office has a few more such cases pending. When prosecutors finish with those next year, Watkins said, he wants his team to take another look at people convicted of arson and those accused of shaking their babies to death. Watkins said he has concerns about the science used in the prosecution of both types of cases. “The science has changed. We need to revisit it,” Watkins said without elaborating. With the passage of SB 344 by Whitmire/Turner, people convicted based on junk science now have a clear path to pursue habeas corpus writs to challenge their convictions, with old arson and shaken-baby cases high on the list of bad science likely to be challenged. It will be welcome news if Watkins takes leadership and gets out in front of those issues the way he did on DNA testing. The main difference will be that, until the Legislature changed the law in 2011 (SB 122 by Ellis), DAs could prevent DNA testing in old cases if they chose, just as Williamson County DA John Bradley thwarted testing in the Michael Morton case for many years simply by objecting. By contrast, the passage of SB 344 means junk science cases can now get back into court via habeas writs on their own, so Watkins and other District Attorneys will be forced to revisit them whether they want to or not. Craig Watkins has done groundbreaking work in Dallas reviewing old convictions for which DNA evidence was available to allow for it. This was possible in part because Dallas County obsessively kept all their old case evidence, but it was Watkins who had the vision to look at old cases where the potential existed for a conviction that had been based on potentially shaky evidence and for which a more definitive answer could be established. Dozens of wrongly convicted men were freed as a result. DNA evidence only exists in a small percentage of cases, but there are other kinds of cases that can and should be reviewed, beginning with the “junk science” cases highlighted in SB344. It’s way past time for Harris County to conduct a systematic review of its own of old cases to see which of them deserve a closer look. We will be under the mandate of SB344 for some of these cases, but there’s no reason to limit ourselves, or to wait till the last minute. It’s beyond question that there are people currently in jail after being convicted in Harris County that are provably innocent of the crimes they were convicted for. In some cases, as with the just-released “San Antonio Four”, the crime in question never actually occurred. We already have to take action for some of these. Let’s commit to doing a thorough and exhaustive job of it. I look forward to hearing what Devon Anderson and Kim Ogg have to say about this. Democratic Dallas County commissioners narrowly agreed [Tuesday] afternoon to join a lawsuit against Republican Texas Gov. Rick Perry over state efforts to enforce a controversial voter identification law. Democratic Commissioner Elba Garcia stepped out of the partisan fray inextricably linked to the national debate on voter ID laws and joined Republican colleague Mike Cantrell in voting against the move. County Judge Clay Jenkins and commissioners Theresa Daniel and John Wiley Price, all Democrats, votes for the measure. Supporters of suing, including District Attorney Craig Watkins, said the move is an attempt to protect voters’ rights. 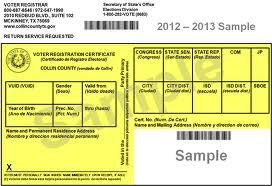 An estimated 220,000 county voters lack the identification the law would require. Cantrell, the lone Republican commissioner, accused his colleagues of using county funds to push a partisan agenda. Garcia criticized the lack of detailed information on what joining the suit will cost. Here’s a fuller story in the DMN that adds a few more details. Missing from the vote at Tuesday’s Commissioners Court meeting was a clear idea of just how much the county’s direct involvement will cost taxpayers. That’s largely because commissioners haven’t been told what expenses will need to be covered — or how much of those costs will be paid by the lawsuit’s existing plaintiffs. Before the vote, Cantrell failed to get attorney Chad Dunn to provide ballpark figures of the suit’s total cost or each plaintiff’s likely contribution. That ambiguity prompted Garcia’s opposition. Garcia said she wanted more time to figure out how much the county could end up paying Dunn’s firm. She said officials were told they had to vote Tuesday so that the state could be served with legal papers in the case before a hearing scheduled for next month. Garcia said that state leaders still hadn’t been served with the initial complaint from the lawsuit, which was filed in federal court in June. “When I ask for one week and I’m told it’s now or never, you won’t be a part of it, I take that as my questions are not important,” Garcia said. When asked why attorneys couldn’t request that the September hearing be moved to allow both sides more time to prepare, Jenkins said there is no guarantee such a request would be granted. As she did on the campaign trail last year, Daniel said managing the county’s budget is the primary job of commissioners. But she added Tuesday that fighting the state is the “right thing to do” because Texas is using taxpayer money to disenfranchise voters. “That’s wrong, but that’s on somebody else’s plate,” she said. According to this DMN story from before the vote, the commissioners voted to hire a law firm to join a federal lawsuit. That would be the Veasey lawsuit, which of course is now enmeshed with the Justice Department lawsuit. I’m honestly not sure what the practical effect of this will be, but hey, the more the merrier. The question about how much this will cost is a fair one, and if it turns out to be a bigger number than expected it will be a political issue for County Judge Clay Jenkins and DA Craig Watkins, both of whom are up for re-election next year. As for the complaint about pushing a partisan agenda, well, tell it to Greg Abbott. A statement from the Dallas County Democratic Party is beneath the fold, and BOR, The Trib, and Trail Blazers have more. Claude Jones was a Texas inmate who was executed ten years ago. He protested his innocence of the crime for which he was put to death till the end. Now we may get to see if he was telling the truth about that. Visiting Judge Paul C. Murphy this week ordered testing of a strand of hair from Claude Jones’ case that death penalty opponents believe might provide the first DNA proof that an innocent man was executed. Murphy issued a summary judgment in favor of the New York-based Innocence Project and The Texas Observer, an Austin newsmagazine, which three years ago petitioned to do mitochondrial DNA testing on a hair fragment recovered from the counter of Zell’s liquor store in Point Blank, about 65 miles north of Houston. San Jacinto District Attorney Bill Burnett, who had assisted in the prosecution and died this month from pancreatic cancer, blocked the hair’s release. He argued state law provided no legal avenue for him to relinquish the 1-inch strand after Claude Jones’ death. Neither Burnett’s attorney, David Walker, nor the first assistant, Jonathan Petix, who has temporarily replaced Burnett, could be reached for comment on whether they will appeal. A key witness during the trial, Timothy Jordan, has recently recanted his testimony that Claude Jones had confessed being the triggerman to him. Jordan now says [co-defendant Kerry] Dixon told him that Claude Jones did it. Dixon, who has made no police statements, is currently serving a life sentence for his part. But Walker has contended DNA testing cannot provide conclusive proof of Claude Jones’ innocence, only propaganda for those opposing the death penalty. He notes two other witnesses described seeing a pot-bellied, middle-aged man wearing clothing like Claude Jones’ enter the store, although neither could positively identify him. Petix has also said releasing the hair could open a “floodgate” of requests for things such as O.J. Simpson’s gloves. They contended state law only allows a defendant to request DNA testing. 1. To this day, I do not understand the fierce resistance that DAs like Bill Burnett put up to post-facto DNA testing. I get that at some point you have to declare a case over, but the Burnetts of the world always come across as fearful to me. If you’re so damn sure you’ve convicted the right guy and that this whole exercise is nothing but a propaganda ploy by death penalty opponents, why not call their bluff? If I knew I was right I’d welcome the opportunity to prove it to God and everyone. What better way to give the middle finger to all those annoying activists who’ve been pestering you all these years? Unless of course you’re really not at all sure you’re right and you’ll do anything in your power to find out. Which is why these guys all look like a bunch of fraidy cats to me. 2. The oft-made “it would open the floodgates” claim is specious on its face. Only a small percentage of crimes involve DNA evidence, and in many cases where it existed it wasn’t preserved after the conviction. Dallas, the hotbed of DNA exonerations, is that way because its longtime DA, Henry Wade, was bizarrely obsessed with preserving evidence, and they’ve basically run out of cases to review in less than four years. There would be an initial spike, sure, but it wouldn’t take more than a couple of years to work through it all. Just eliminating the drawn-out court battles over whether or not to do the testing in the first place would make it all go a lot faster. Anyway. We don’t know what that DNA evidence will tell us, but we’ll be better off when we do know. Grits and Matt Kelly have more. For the 11th event in our TribLive series, I interviewed the district attorney of Dallas County about why and how he’s worked to exonerate the wrongfully imprisoned and whether he’s dragging his feet on a controversial corruption case involving county constables. We’ve provided the conversation with the in three forms: video, full audio and a transcript. They’re all at that link, and they’re worth your time. Check it out. We’re all familiar with the way the Dallas DA’s office has handled using DNA to review cases in which a defendant’s guilt may have been in question. Now that most of the cases in which DNA evidence still exists have been reviewed, they are moving on to other kinds. The emphasis of the conviction integrity unit established by District Attorney Craig Watkins in 2007 is shifting toward challenging cases where there is no DNA to test, but where questions remain about an inmate’s guilt or innocence. Without DNA evidence, these cases require more time and can mean investigating a crime that occurred years ago as though it just happened: tracking down witnesses, comparing fingerprints to see if there is a match when one didn’t exist before, seeking new evidence. Watkins says he hopes his office can use lessons learned during years of DNA testing to improve police work. Bad witness identification, for example, has been a factor in most of Dallas’ DNA exonerations. There are also several cases where prosecutors or police withheld evidence that could have prevented a conviction. Watkins said his perspective has changed since the unit began. He’s realized that it can do much more than free the innocent. Grits has more about this. The key point is that DNA evidence only exists in a small number of cases, and it’s relevant in an even smaller number, but the same kind of evidence and procedures that made the DNA-available cases worthy of review – eyewitness identifications, bad arson science, “scent lineups”, etc – exist universally, and should be looked at as earnestly. It may be harder to show anything definitive, but if they do nothing but codify their best practices to avoid arresting and convicting people in the future based on this stuff, it’s well worth it. Now if only other DAs would follow Dallas’ lead on this. The Trib has a fascinating article about Dallas DA Craig Watkins, who is running for re-election for the first time this year, in which he defends himself against charges that he has not been sufficiently vigorous in prosecuting political malfeasance. He’s been skewered in The Dallas Morning News and the Dallas Observer for taking no public steps to prosecute two Democratic Dallas County constables facing accusations of bribery and kickbacks from their colleagues, and for seeking a restraining order when Republican county commissioners hired their own investigator to look into the charges. (His Republican opponents say he’s protecting the constables, who are fellow Democrats.) His latest power play? Watkins shunned two separate offers from the Texas Attorney General to help investigate the constables. Watkins has also made headlines over his campaign finance spending habits — paying tens of thousands of dollars to family members or the businesses they operate. And he’s caught heat for an alleged conflict of interest: His wife’s political consulting firm represents judges who preside over the same county courts where his office prosecutes cases. Watkins counters that ethics rules don’t prohibit hiring family members or using family businesses to run campaigns (in fact, it’s a common occurrence). And his wife’s political consulting business has checked out all the way up to the State Commission on Judicial Conduct. He staunchly refutes the toughest allegation against him — that he was using campaign funds to pay the utility bills for the family businesses that share his campaign office space. “I have only ever paid my share,” he says. On the one hand, I can’t really blame Watkins for not trusting Greg Abbott to investigate the constables. It’s not like Abbott’s office has a track record of even-handedness and impartiality when it comes to political matters. On the other hand, it’s hard to understand why Watkins hasn’t moved more quickly to take action against the constables, especially given his unwillingness to let the AG get involved. The decision to own that is understandable and defensible, but only if you’re seen as following through. All I can say is I hope he’s got something going under the surface. The thing I found curious in reading this article is the implication that other Dallas Democratic candidates’ fortunes this fall are tied to Watkins’ re-election. Watkins himself pushes this line of thinking. It’s clear from looking at the county returns in Dallas for this decade that the biggest reason why Democrats have been so successful there of late is because the number of Republican voters in the county has fallen off a cliff. In both 2006 and 2008, there were about 30,000 fewer Republican votes cast in Dallas than there were in 2002 and 2004. Dallas Democrats swept the countywide races in 2006 even though Democratic turnout was down from 2002, thanks to the much steeper dropoff in Republican voting. I’m not aware of any evidence to suggest that this trend has reversed itself. It’s possible that things could blow up enough around Watkins to depress Democratic turnout sufficiently to imperil folks, but given the numbers that would have to be a significant event, and it would also have to be enough to counter other factors. (It’s also possible that these issues will jeopardize Watkins’ own re-election, but not affect anyone else.) With all due respect to Watkins, who ought to make an exciting statewide candidate in the near future, he won’t be the only candidate working to get Democrats out to the polls. I’m a little concerned about his prospects, but not about Dallas Democrats in general. Meet Dallas DA Craig Watkins’ Republican opponent. I thought he came across better than the commenters did, but I feel pretty good about Watkins’ chances nonetheless. Via Grits. Some love for Bill White, including the Bill Whites for Bill White ActBlue page. Hank Gilbert speaks to WFAA in Dallas. Get ready for Teabagging II: Electric Boogaloo. Martha, John, and Stace comment on the Gene Locke robocalls, in particular the one from County Clerk Beverly Kaufmann. Rick Perry claims his website was hacked. The evidence suggests otherwise. Don Large, the now-former campaign manager for Council candidate Carlos Obando, informed me today that he is filing paperwork to run for Harris County Republican Party Chair. He’ll be the third challenger to current Chair Jared Woodfill. Remember when Dallas was a stronghold for the state GOP? Those days are long gone. After two straight losing cycles that forced them out of power, Dallas County Republicans will feature a scaled-down ticket for the 2010 elections. Party Chairman Jonathan Neerman says it doesn’t make sense to recruit candidates for well over 50 countywide races. Instead, the party is focusing on a handful of judicial races and the contest for county judge. And unless Ronald Reagan rises from the grave, Republicans won’t recruit a candidate to run against District Attorney Craig Watkins . Neerman, who says he will personally handle the recruitment of judicial candidates, is hosting a candidate slating meeting Thursday. He says Republicans have no more than 20 candidates ready to run for various judicial posts in 2010. That’s less than half of the countywide ballot. Boy, how the mighty have fallen. As you know, the Harris County Democratic Party was very recently been on that side of the fence, so I know where Neerman is coming from. I don’t think that strategy works, but I know it’s really hard to get good candidates to run when they have little prospect of getting adequately funded and little chance of winning. Even after the two consecutive drubbings the Dallas County GOP has received, you’d think that in a state where various Republican candidates are touting multi-million dollar fundraising hauls there’d be a few bucks to spare to keep the second-largest county in the state from becoming completely unreachable, but I guess not. Gonna be hard to hold onto some of those State Rep seats, even if they get a friendly map in 2011, that’s all I can say. Anyone think this might be a preview of things to come for their colleagues here in Harris County?